This month’s atmospheric river in Northern California is an apt backdrop for the San Francisco Bay Area blog Blue-Green Building: Building Cities that Protect Streams, Bay, and Ocean feature on Carducci Associates’ El Cerrito City Hall. The civic space highlights the ability of landscape architecture to create ecological and hydrological systems as stormwater management infrastructure that also contributes to a sense of place and regional identity. El Cerrito City Hall, built in 2010, consists of a LEED-certified building and landscape that are designed to complement each other. Recycled building and site run-off irrigate the California native plant demonstration garden and drought-tolerant plantings. Custom furnishings include a fountain inspired by the journey of water that travels from the Sierra Nevada to the Pacific Ocean. The full article can be read here, and more information about our project is available here. Blue-Green Building is written by Friends of Five Creeks, “an all-volunteer creek- and watershed-restoration group working in North Berkeley, Albany, Kensington, and south El Cerrito, and Richmond, Alameda, and Contra Costa Counties” in California. 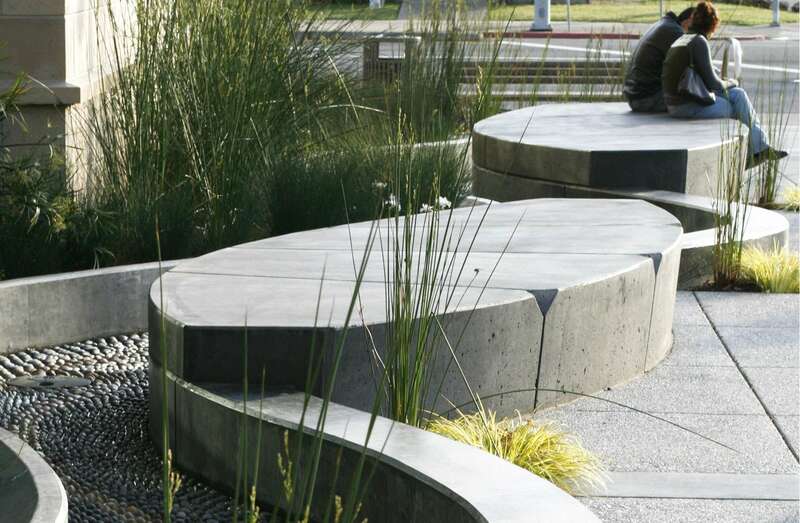 Carducci Associates' custom seating and fountain accompany a native, drought-tolerant, and educational civic space. 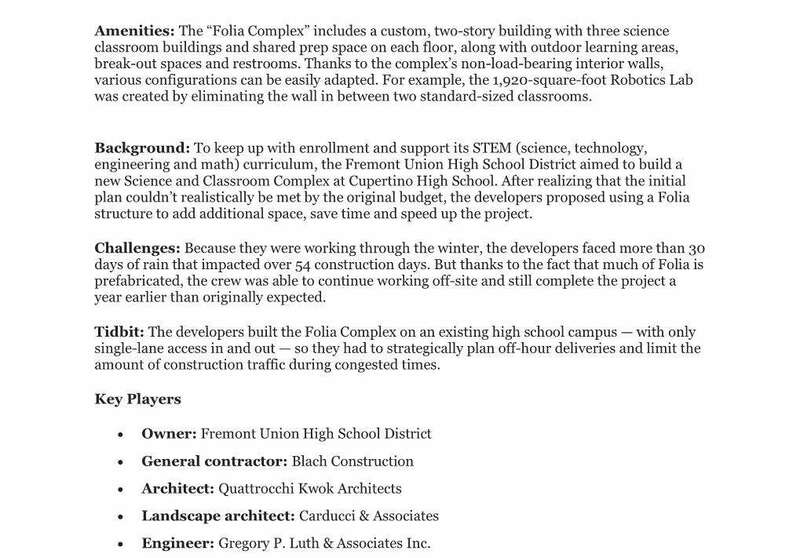 One year ahead of schedule and $3 million under budget, Cupertino High School’s new science complex received the 2018 Silicon Valley Structures Award for its Innovation Project category. 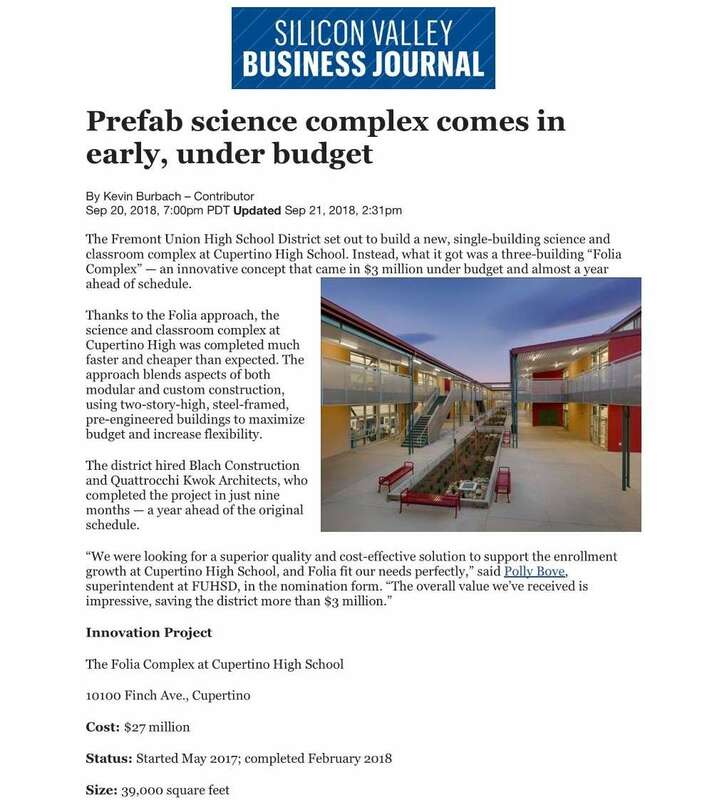 The Fremont Union High School District worked with our team to bring new facilities, including outdoor classrooms, to the school’s growing STEM curriculum and enrollment. Silicon Valley Business Journal explains the factors that led to these successes in the following article, originally published here. Carducci Associates is excited to announce the opening of the UCSF Benioff Children’s Hospital Oakland Outpatient Center. Designed as a LEED for Healthcare Silver project, this new 89,000 square foot center is the East Bay’s pediatric specialty care facility was completed in partnership with HDR and Taylor Design, and includes an outdoor rehabilitation clinic. The design emphasized connections to the existing facilities and surrounding neighborhood, using landscape elements such as the sensory garden at the visitor’s entrance and children’s play area. 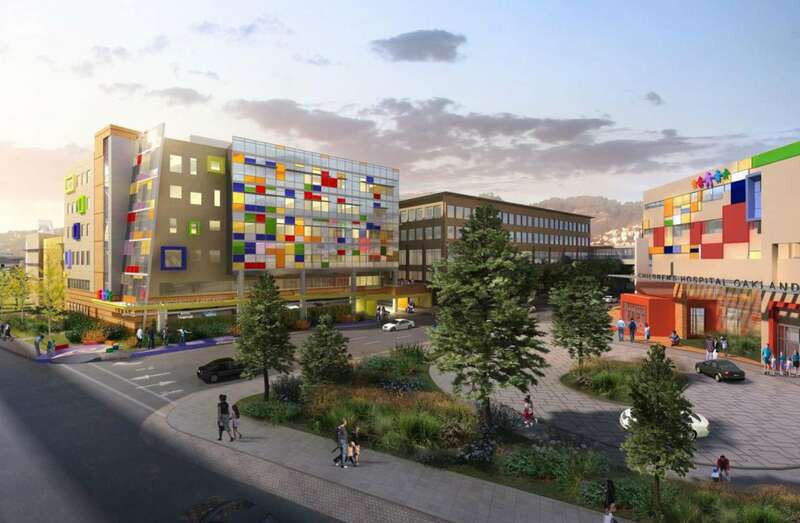 The building’s “colorful glass and panel facade” and landscape designs are integrated to create vibrant spaces for children’s health and healing; colored panels on the building’s exterior . View our project details here. Celebrating Leadership At Carducci Associates / Monty Hill Promoted to Senior Associate! Carducci Associates is excited to announce our growth in leadership with the promotion of landscape architect Monty Hill, LEED AP, CID, to Senior Associate! For five years, Monty has brought his sense of beauty and technical expertise to many teams and projects, always with singular calm, respect, and thoughtfulness. With this promotion, we celebrate Monty’s achievements in the firm. Monty began his career as a civil engineer focused on the technical aspects of watershed analysis, hydrology, and stormwater management. Subsequently, his interest shifted to the design of people-oriented spaces and the creative aspects of landscape projects. Monty returned to school to study landscape architecture at UC Berkeley Extension. Concurrently, he was able to immediately apply his new skills at a high-end residential landscape firm designing poolside rural retreats and sustainable urban garden spaces using refined materials. After graduating with distinction, Monty turned to public and commercial design opportunities to apply his creativity and technical skills to the wider audience that Carducci Associates affords. 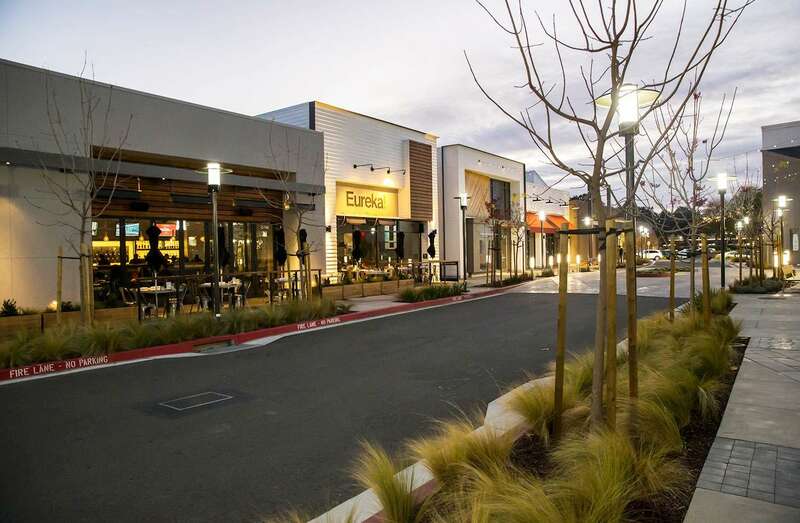 He enjoys making a difference in the lives of everyday people by creating functional, sustainable environments such as Willows Shopping Center, Fallon Sports Park, and Cupertino High School. In his new role, Monty looks forward to working on future projects at Carducci Associates and mentoring the next wave of landscape architects. Grasses glow as the evening sets in at the Willows Shopping Center, Concord, California.